Everyone is responsible for keeping his/her pit area clean. The property should be left as clean or cleaner then when you arrived. There are trash cans throughout the area, use them. Full size vehicles are restricted to 10 kph. If you are caught breaking this speed limit, you will be asked to LEAVE the property. These tracks are for RC cars only..NO other objects with wheels are allowed on any of the tracks. No abusive or foul language will be tolerated. We wish to maintain a family atmosphere and children may be present. Alcohol abuse in any form is prohibited. By abuse is meant intoxication, public display of alcoholic drink and drunkenbehaviour. 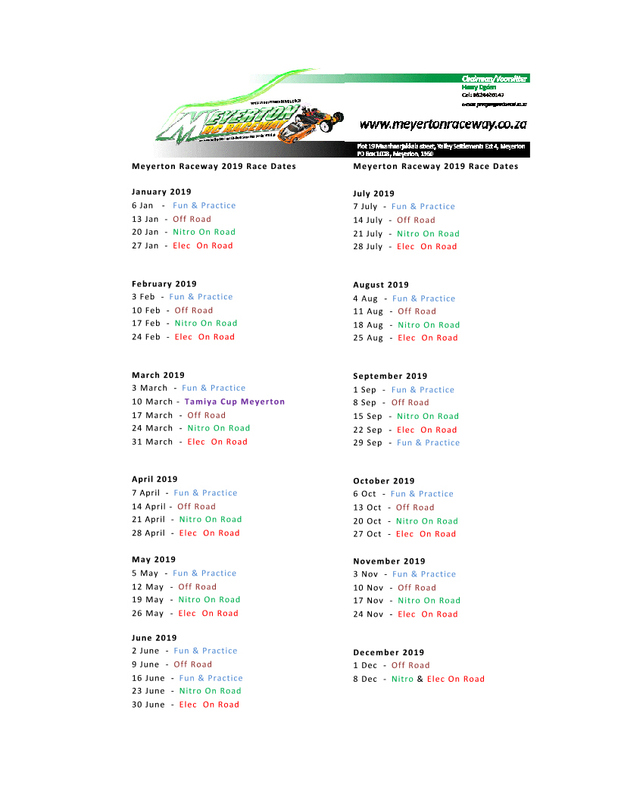 The club will organise all the races held and will be in control of all the activities on the premises.. The club will allow for competition of all categories eg. cars, trucks and buggies. It is the intent of the club to conduct all practices/races in a clean sportsman-like manner. Any attempts to deliberately bump or ram another car or run it off the track will be grounds for disciplinary action. Continuous disregard for other cars on the track will be assumed to be deliberate ramming. Disciplinary action can range from removal from the track to permanent ban from the track by vote of the club membership. Good communication is essential. Shout out when your car stops or is immobile on the track. This will help avoid accidents and broken parts /cars. Furthermore, shout out when entering the track to move or retrieve a car. You are a big blind spot to other drivers when on the track. This will help avoid collisions. Do not switch on your transmitter or drive your car in the pit area. (safety reasons). Remember motor racing is a non contact sport. Try and avoid crashing into other cars. (repairs can be expensive). Faster drivers should remember that it is sometimes faster to driver around slower cars than having them make an unexpected move to get out of your way. If you crash, do not keep your thumb on the go lever. The marshal can and will put your car on it’s roof until the wheels have stopped (this is for safety reasons). Drivers must not swear at the marshals or other drivers. Drivers must NOT race their cars up and down the straight when tuning the car…it can cause costly accidents. During race events, never drive your car without it’s body. You must marshal the race after yours, even if you did not race. The laps from your fastest race will be deducted if you do not marshal. Drivers must not leave the rostrum until the computer has called race over. Everyone MUST turn marshal! After your heat race, you are required to turn in your transponders and radios, then turn marshal the next race. We are not a babysitting service. If you are caught not reporting to a turn marshal position when required, a 2 lap penalty will be enforced on your best heat race or final. This could mean the difference in winning and losing. We call all turn marshals to the track as a group. We will not call individual names to report. If you are physically incapable of safely turn marshalling, LET US KNOW. We will find a suitable substitute. Therefore, you must notify us of this BEFORE the next race. How can we know???? Go to your marshalling point immediately after your race. (only one marshal at each point). Use the day-glow jackets. these are for your safety. Remember to keep watching your section of the track. When going to retrieve a car, watch out for other cars and do not obstruct the vision of other drivers. Take care to put the car back on the track facing the direction it was going before it crashed. You may look for obvious problems with the car which are easy to fix, it is not your job to take the car to the driver during the race. Take care not to put the car you are marshalling in front of on-coming cars. If a driver has kept the power on and the wheels are still turning, place the car on its roof until the wheels have stopped. You mate’s or son’s car is not the only one on the track. You are expected to marshal even if you did not compete in your last race. Remember. one day the favour could be returned and it could mean the difference between being a trophy winner or a second place. All kids must have an adult with them at all times. Children are not allowed to run/play on the track at any time. We want kids to race and have fun but they must have adult supervision and not be allowed to be unruly! All running of cars is on the track only!! Also abide by all the rules that the older racers abide to. Do not stand on the corners or too close to the track. Do not walk on to the track while racing is in progress. Unless you have volunteered or have been asked to marshal, please leave the cars and track alone. A race is not over until the computer has called race over. There are only 42 channels we can run. The probability of someone else running the same channel is HIGH. When arriving at the track, report to covered area to get your frequency clip. This high tech device will save your truck. It’s just a laundry clip with a frequency number on it but is very effective. Frequency clips must be displayed on your transmitter at all times when your car is on the track. (Spektrum and the like are excluded) Most importantly drivers should only turn on his/her transmitter when he/she has a clip from the frequency board. If you are found without a clip while running your machine, you will be asked to turn your radio in at a track official (radio impound). If your radio frequency is not available, a track official will assist you in making some arrangement to sort you out. ALSO NO KIND OF RADIO CONTROL VEHICLE IS TO BE RUNNING IN FRONT OR ON THE SIDE OF THE VENUE AT ANYTIME!!! That Is Why We Have A Track! WE ARE SERIOUS ABOUT THIS RULE! If you break this rule, YOU are responsible for all damages to other vehicles or track property! OR YOU WILL BE ASKED TO LEAVE THE PROPERTY! When driving on the track, where slower cars are being overtaken and passed by faster cars, the slower car should try to maintain a consistent path around the track. The faster car will be responsible for selecting and executing the proper passing option. I have read and understand the track rules and code of conduct. I agree to abide by the rules set forth and understand that failure to comply will result in loss of track privileges (yes, it is a privilege and not a right). Because of the nature of this sport, MEYERTON RC RACING CLUB cannot be held responsible for any damages or injuries sustained on MEYERTON RC RACING property. Basically, you’re on your own. If you see any unsafe act on the property, report it to a track official and it will be addressed. Safety is everyone’s responsibility and should be taken seriously. We encourage and practices safe acts. We expect our members to do the same.